Superb Resolution, Vivid Color, Feather-fine Detail! The Questar Birder is the spotting scope everyone turns to when identification hangs in the balance. Standard powers of 8.5x, 40x and 65x resolve details that are feather-edge fine at 20 feet or 2000 feet. Optional available eyepieces can vary this to increase powers. The built-in multi port control box allows for Visual & photography. 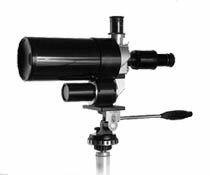 Our 89mm aperture and long 1300mm focal length provide light grasp and the power to reach out beyond the limits of other scopes. Our unique Control Box allows three magnifications without changing eyepieces, with a camera mounted at the same time. Focus is perfect from edge to edge, eliminating the eyestrain associated with field curvature. Colors are completely distortion-free and vivid. Each Questar is tested and guaranteed to out-resolve any scope on the market. The Questar Birder's rapid focus will aid you with speed and precision when changing powers or pursuing targets. With an instrument weight of less than 4 lbs. (13 lbs. in its waterproof carrying case), the Questar Birder travels effortlessly.